r'..s. lDI-'..\AKTMl~\I"' (r 1 .i\( ;1k ( 1. 1 l 'R,:l..
BUREAU UF ENTOMeDLiGY-CIC'LA.II ,. 1..
BUREAU U (H." 1:\"tlO I .fH;v.
L. 0. IIOWARI)D, E it,,,vIlgil 1i1dl thi f ,if Il-'i iut. C. L. MARI IT-. I"ln t1,t',ll'lgii i lnil .A( ling ('i irf in .Ib\ iv, of 'Ihirf. It. S. (CLIFTON. .t i filliri 1 i.,i'l riil. W F. TA.-II r. 1', itf l' I ..
F. H. CiI ITTMENIE.N. in charge of truck e-roi, ,l .xluor'd Inoilurli in.u' ii ,' .l iatifiions. A. D. HorKI NS, in charge of forest iiinvl ii rv'sliguitiuOn..
W. I). HIUNTER, in charge of southern firlih (ripIi in.rcl itn .''liiljlit,,. F. M. WEBSTE, in charge of cereal andl fuirigr" intfscCe ili i .%liili'iui'. A. L. Qi.i NTANCE, in. ciimpt of decidluouii. fruit insect in 'rrfigifin,. E. F. PIILI IPS. in charge of bir culture. D. M. ROGERS, in charge of re I'i tliu .re 'iinl oif nt/,.., flild uri'i'l,. ROLIA P. ('TURiti in inrieiir of editor i'll wirl,. MIABEL (COLCORD, in ihii if' of lilt,'iil. INVESTIGATION.N IN lit.I. '(I TIRE. F. F. I'111[I.i .,s. in vliirg '. G. F. WHITE, J. A. Nt I.SON, eXl0u'rl. G. S. DEMUTII, A. H. McCHAY, N. E. M(ItmNiH. alpnullurt u.i..xjantis. H. A. SURFACE, D). B. CASTEEL. tollitbiio'iis. CIRCULAR No 157. Iudit M 12i. L. 0. HOWARD. Fniormn,.lov.it and Chief of Bureau. THIE (CA UIS: OF FlUIPEAN FO ,L 1I911OI). By (I. F. \ NHITS:, M. ID., IPlh. ID..
(itili l.ui-rv of European iiil brood. Bi,, ;'lhux ul,. i. ( 'h -li ire :iiret',l that the ii liil iti ilioni was correct. it- t'aiii-' i:ibctcriilin to which ho' ir:ivt the name ltn,.;ll/. mrlii. Sw itzerlind when he rc frrrt.I to" -mour brood." In the disease he li'. cIv 'er0 It baicteriumn to %l which li, referred as the 'p/0tolu '/--frinl-." Ilillli d thi Il '\'w pe'ii'-Sf/,, ,tiv . ".' '#1';'. (Mi lF : %R. IFR 'UtKK BY TIlE. WRITER ON EUROPEAN FOUl BR(iOD. THE CAUSE OF EUROPEAN FOUL BROOD. about this org-li-ni it was referred to in 1908 as "" B, ;1is 1'." of the bacterium ca using it. tain the virus and that the disease couhi lie produced by feeding. ments where pure cultures of either or both organi-um- were used. was referred to as BiIlbs Y bore a cai' .il relation to thlie disease. more definite statement could be made. sidered in this preliminary paper. experiments were performed, using pure cultures of tlme-e two species. tlintl 1 iiil Ibeen ir(vioIuslv obtained. |IE( i~r \\(lli lIy TIll : W1SITKI. I rtro, / vly tI I i i 'IicatIe certain i c nclusio s-, there was still tli,. f i'm-I tion ol' ( lie character IlTi. I for I;Is ien itaIined. 'Ilir. lhiti,-. Sn,', 'olonic- were fed diseased bro I tIhat conta iiced, a-. sta-'r- of lthe li-.ei-. some new species were foundl to be present. is a small, slender rod. apparently nonmotile and non-pore IcAbin,_. fed pu1e cult tIre- i f this -p,',ie-.. lht no disease has Ieeln 1,rI,,li'-,1. ir-t to le millentioned is a iiitile. vare-lI ,riin .. e;i-ilv niliv.'t;lailil. T illm ; t' it., n I.1 liw .\ tIi l'il'l, Ill ir ii i. THE CAUSE OF EU'ROPEANX FOUL BROOD. The possibility of an ultranimicroscopl)ic virus. was al-o considered. was then made in boiled water and(] filtered with the Berkefeld filter. observed to which the exciting cau-e (ourld be attributed. SYMPTOMS MANIFESTED BY LABRV. : qIt K OF EVROPEAN FUL BROOD. ll': <. '.\ '.l' l I 1 1 1: %' N I I I I. In" 1 .
untitl it, Ill median dorsal line is exposC d t the I bIserver. larva thi.,- mass is ri-c'qini itK seen to e ilt, i o aI, I fro. A OSiTIVEmVr TEST TOR TE DIS IN iDII.SE I ARV. content camn i t he removed in this wAV. mniuciusilike in appearance. TIi :i|'pc-i rance of this outer porti)o,1. stage of the disease when the exanmlitation is made. sented in eitlthtr or c of the samte figiIe. 'I lI -: CA I"-. .' I I 1 P',-l't \N* I I 'I L I:* ,. ,,- . yet dead of the disease. (Original. recently tIea d. Tlitv are c.-pt,. the apiary a,. well as in the experimental colony. '*Ife i \l'-I -t 1 I l li'l.%N lilt 1 I, 100i n l). European foul brood is, therefore, still further confirmed. MICROSCOPIC STUDIES OF DISEASED LARVW. therefore, may, and probably will, be changed later. .,ligrv id' i lie ili'rai-,,. kut iln cmparatively small m lr,. i|li., tlnil represented ill I'. ti.,iii" exai iied l ieris,,,iir l ,i,' \. fii,,'; ,,v luton is st ill f i nl in Ir lirge iiuin I TH.., 1 ',,tr iii. la1r1i \vlw,, the disease is far sadvt;, I .l ani M i le 1 vdy wall is ,ii 1 k l ,i.
with which this species is mentioned in reports on thii di-,c,:. that Bacillus pluton was the fir-t invader of the healthy larva,'. substance, m, and the paplike food substance. J, of the midgut. is easily killed by heat. milii or BR ;lhi.. alvei-which he cultivated on artificial media. tiliIt .tviur iumll whlifh lihe (rltivitold maltd uh y'rilkd !<,1,,. Yl+ RI % FtU I' I ltV ilmml? ,il" y th one ,i --i. known in Anericai ais Europea in foul broilod. fund tlhit B-, i/,.l, il',ei actually cauiseso aln ilnfectiois brood di-.-v:i ..
S l IMARY AN)D CONCIINlNS. thatR /'". ,/,. t/i was probably not the cau-e 'f a di-sease. 1["l. CAI -I OF 11 I;,,1'! \0 014 % 1 I L l loiil . 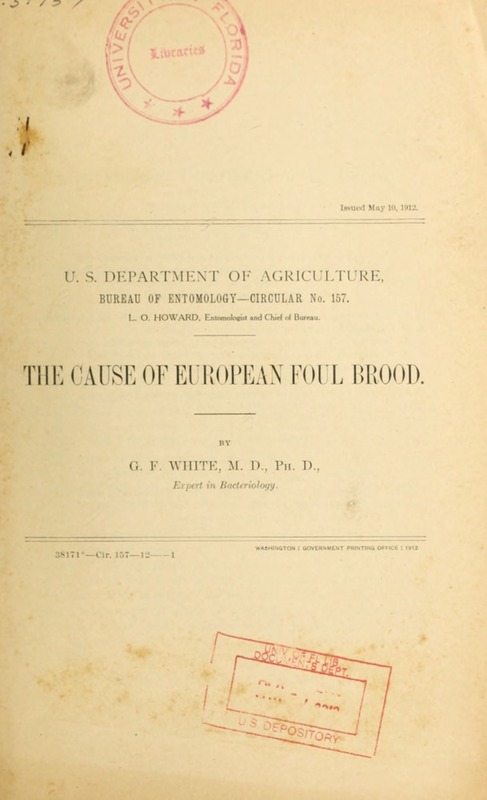 THE causeS E OF EUROPEAN FOUL' BROOD. exciting cause of the disorder. B,, i'l,,f larva to healthy bee, American foul brood could be produced. contained in the diseased brood. frequently found, when examined, to b)e free from Btrilus al,,e;. the cause of a brood disease. likewise eliminated from the list. brood caplible of producing the disease. and became thus the probable exciting cau-e of European foul brood. ever, occurred in relatively small number-. and sectionina larvae bringg the inciubhation 'period of the disease. This study demonstrated that in thlie product ion of the disease Baf4lis. pluton was the first invader of the healthy larve. place, this parasite was found to be thle first invader. iIipir.ilIV iii \ iiinfectiiil i ri +r. the s< ,il,'.I "I pickled lwriod." , L 'T illii- lii "1 li ,'\ i li li ,L '" in i !e o f l iis dli-f i'd ht r i > iiotl V f t k lio w l .
' il .k I \1 . '- i l I I I : Li %N \ I 'll"., I :I 11,1A.